In this study, I demonstrate, by analysis of its form of description, that the character of Santo Mintan Shu Volume 1 was, with respect to the transition of legends, formed as the result of combining several pieces of folklore and religious beliefs. This is based on my belief that the association of these two elements happened contingently, and was developed under circumstances that included intermediation by shaman or mages magicians. I compare the character of the text of Santo Mintan Shu with the author’s project of gathering legends based on the background of social request for fostering love for home and nation following the Japanese-Russo War; and studies of legend by Yaichi Haga that aimed to determine the Japanese national character. Consequently, I found that such descriptions do not assure a continuous essence through the past, present and future of a legend. For example, understanding a legend by casting the light of a present standpoint and viewpoint makes it difficult to find a continuous essence between past ‘Japanese’ and present ‘Japanese.’ Such a description is understood as being an attempt to open a new field of study regarding cultural history in a wide meaning, not a shortsighted one focusing on fostering love for home and nation based on an assumption of the homogeneity of past and present by treating historical events in ‘Japan’ as objects of study. During the period of rapid economic growth in Japan (1950s -1970s), many workers from the countryside moved to urban areas. Due to this, there was a lack of residential homes for such workers. In order to tackle this issue, many housing complexes were built. Today, after 40 to 60 years many of their residents have become elderly. In this paper, lives of residents in a current housing complex described in community papers was examined from the case study of Jindai housing complex, Tokyo. Annual events in the housing complex, activities of the residents’ association for the elderly and complaints to other residents were focused. Lifestyles of the residents of the current housing complex are very diverse. On the other hand, activities and events which were done at home once are carried out jointly in the housing complex. They are figures of lives in current housing complexes which have been neglected so far. This paper considers the idea to life in modern society using Daisuke Takagi’s Faith in “a memorial service for animals and plants” and “benefits gained in this world.” A memorial service for animals and plants as well as used brushes, old needles, old knives and so on is held in Japan as a folk culture. This Takagi’s work is arguing relation between “a memorial service for animals and plants” and an occupation, and he has indicated that a memorial service is held when a hunter, a gardener or a fisherman find the “individuality” in animals and plants. Although they kill animals and plants at work, “individuality” emerges when they do so. 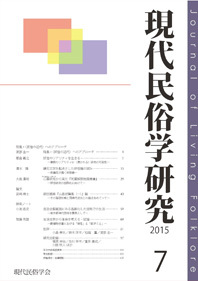 I discussed “individuality” in a different viewpoint from Takagi’s work in this paper. I clarified what kind of positions “killing” have in modern society in relation to the difference between “a memorial service” and “sacrifice”.